Designed for engineering, visualization, and machine learning, the VR-ready Z4 G4 Series Tower Workstation from HP delivers the performance necessary for a wide spectrum of applications, including 3D CAD & rendering, simulation applications, VFX & design visualization, machine learning and edge-computing environments, and other intensive tasks. Its exterior provides tool-free access to a modular interior, while internal cooling solutions help to ensure its components won't overheat. The system is powered by a 3.3 GHz Intel Core i9-9820X Ten-Core processor and 16.5MB of Intel Smart Cache memory, all of which will allow you to run multiple applications simultaneously and provide significant performance gains when running multi-threaded tasks. If more power is needed, the CPU can deliver extra performance by increasing its clock speed up to 4.1 GHz utilizing Intel's Turbo Boost 2.0 technology. The 16GB of 2666 MHz DDR4 RAM comes in a 2 x 8GB configuration, allowing the computer to run multiple applications simultaneously and to quickly access frequently-used files and programs. For long-term storage of your files, this system is equipped with a 256GB NVMe PCIe M.2 SSD with Triple-Level Cell (TLC) NAND flash memory. If you want to add external storage drives, optical drives, printers, memory card readers, or other peripherals, the Z4 G4 features two 10 Gb/s USB 3.1 Gen 2 Type-C ports (front) and eight 5 Gb/s USB 3.1 Gen 1 Type-A ports (2 front, 6 rear), with one of the front Type-A ports doubling as a charging port. There are also two PS/2 ports. For users who wish to add additional components to the drive bays, the Z4 G4 features two internal 3.5"/2.5" drive bays, two external 5.25" drive bays, and one M.2 slot that supports 2260, 2280, and 22110 form factors. The dedicated NVIDIA Quadro P2000 graphics card has 5GB of GDDR5 RAM and delivers a sharp, clear picture while allowing for multiple simultaneous displays to be used via its four DisplayPort 1.4 outputs at resolutions up to 5128 x 2880 @ 60 Hz or 4096 x 2160 @ 120 Hz. Whether you are listening to music, watching a movie, or playing a game, the integrated Realtek HD ALC221 audio controller outputs high-definition audio and delivers higher fidelity than standard audio controllers. Network connectivity is achieved using an integrated Gigabit Ethernet port, and HP's Slim DVD Writer can be used to read from and write to optical media. 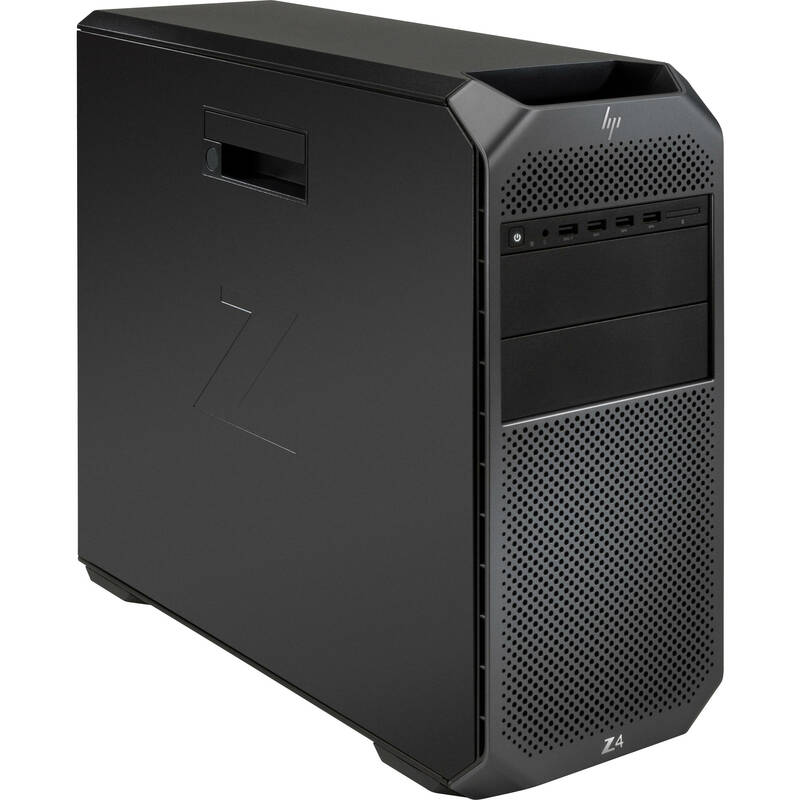 The Z4 G4 Series Tower Workstation includes a USB keyboard, a USB mouse, a power cord, and a Fan and Front Card Guide. It is powered by an internal 1000W power supply and the installed operating system is The installed operating system is Windows 10 Pro (64-Bit). 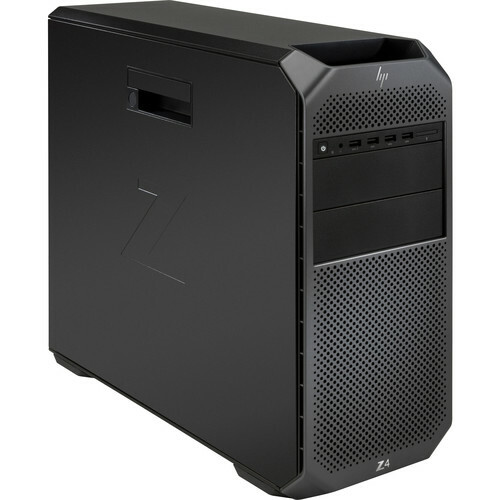 HP's Z4 G4 Series Tower Workstation offers a plethora of standard features. When combined with multiple configuration options, users can select a blend of components to meet their performance requirements. Visualize your project with the power to move seamlessly between 3D CAD, rendering, and simulation applications. The Z4 can handle tasks that require high-frequency processing, multiple cores, and high-powered GPUs for an optimized design process. Advanced security features come standard on every Z4. Rest assured that your device, identity, and data are safe with security software like HP Client Security Suite Gen3 and HP Sure Start Gen3 featuring a self-healing BIOS. The HP Z4 G4 supports up to 128GB using eight non-ECC Unbuffered memory modules. This HP Z4 G4 is configured with the Premium Front I/O option and is equipped with two USB 3.1 Gen 2 Type-C ports and two USB 3.1 Gen 1 Type-A ports, one of which supports charging, and a headset audio port. Internally, there is one USB 3.1 Gen 1 single-port header, 1 USB 2.0 single-port header, and 1 USB 2.0 dual-port header. In the rear I/O area, the HP Z4 G4 provides five 5 Gb/s USB 3.1 Gen 1 Type-A ports, a Gigabit Ethernet LAN port, a 3.5mm audio line-in/mic-in jack, a 3.5mm audio line-out jack, and two PS/2 ports. Slots 1 through 5 support full-height, full-length cards (with an extender). Open-ended connectors allows a greater bandwidth (e.g. x16) card to be installed physically into a lower bandwidth connector/slot.